I’d never been to Disneyland before. The truth is that I’ve never been big on theme parks since being traumatized as a kid on one of those swinging pirate ships on Sentosa Island where I thought my lungs were being repeatedly ripped out of my body on each and every plunge. Scarred for life by theme parks and armed with little to no expectations, I was convinced to relive my childhood again after much persuasion from Jo who loves just about everything about Disney. Despite the sub-zero temperatures in Paris, for 3 whole days I really did feel twelve years old all over again… waking up in a world where my sole calling in life was to go to infinity and beyond with Buzz Lightyear and ride the East Australian Current with the turtles from Finding Nemo. Sure, everything about the place from the Wild Wild West Frontierland to the Marrakech-look-alike Adventureland is a little artificial and man-made… but there really is something quite special about it all. Something in the air even drove me to brave the 3 or 4 big rides and overcome some of the chicken-shitiness that I’ve been living with till now. So what does one do for grub in Disneyland? I was half expecting terrible fast-food and ghastly expensive mediocrity at the resort’s restaurants. Well, damage is about 10 to 15 euros a head for a fast food meal, and upwards of 30 euros for table service. But cost aside, most of the meals really weren’t too bad at all. In truth, given some of the extraordinary settings of the restaurants, I’d say they’ve earned the right to charge the premium for the ambience alone. 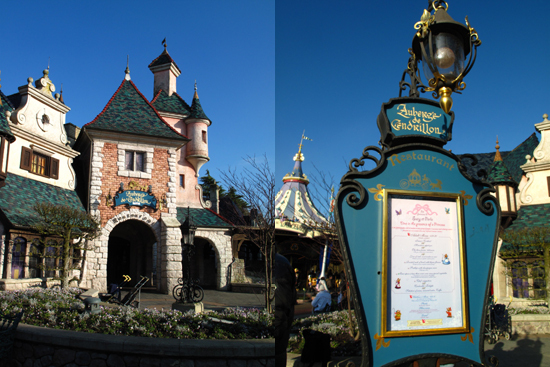 L’Auberge de Cendrillon, themed around the story of Cinderella was our first port of call for dinner. With an intricate gold carriage outside this 15th century medieval inn as well as Belle and Cinderella themselves for company, Disneyland Paris’ most expensive restaurant had its work cut out to justify the 50+ Euro per head asking price. The food was classic French with the usual suspects of foie gras, Duck Breast and Crème Brulee making appearances across the starters, mains and desserts. The food was decent, and what it lacked in wow-factor was certainly made up for through the generous portions, refillable wine and framed Polaroid photograph of Cinderella and us which came as part of the package! We stopped for lunch the following day at Frontierland’s Cowboy Cookout BBQ where Slow-cooked Ribs, Barbeque chicken, and other Southern USA comforts were served up fast-food-style in a cozy Cowboy ranch. Contrary to my fast food prejudices, everything from the Chilli-Con Carne and Cornbread to Smoky Ribs were absolutely delicious! (so much better than Bodean’s I tell you). Our other meals were in settings which were just as psychedelic. 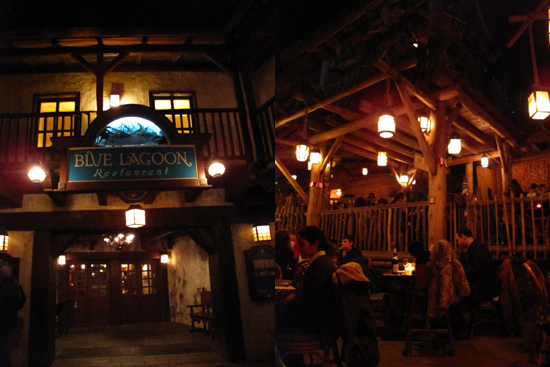 We had dinner at the Blue Lagoon – a Carribean Seafood Restaurant themed around the Pirates of the Caribbean. Jerk seafood, salt fish croquettes, deep-fried Mahi-Mahi and Grilled King Prawns were amongst the fare on offer. In fact, the restaurant itself is on the set of the park’s boat ride, inevitably leading to the shouts of “Bon Appetit” from the many French youths passing by. Food though was pretty mediocre and nothing to shout about. Our final lunch stop before coming home was at the intricately decorated Agrabah, which as you would expect from the set of Aladdin had a Middle-East and Mediterranean-themed buffet to match its Bazaar-like interior. The unlimited chicken tagine, taboulleh and shwarma meats were all very decent – good value for the 20 EUR per head cost. 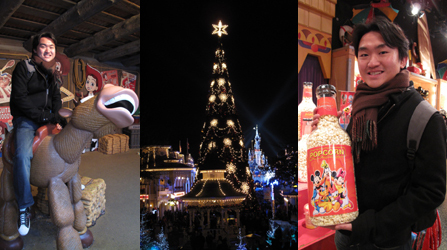 I can’t think of a happier place in the world to start the New Year… All the infectious similes and awe-inspired looks on the faces of children and adults alike is priceless…The perfect place to escape for that happily ever after. Martin: Thanks for the kind words. I’m glad you enjoy the blog.